The entire team at the Mercure Paris Arc de Triomphe Etoile hotel welcomes you to Paris. Take advantage of our location in the heart of the capital to stroll down the famous Champs-Élysées. We look forward to welcoming you! In the Ternes district, Mercure Paris Arc de Triomphe Étoile provides a relaxing stay, 500 m from the Arc de Triomphe. Completely renovated, our Paris hotel offers clean designer rooms and 2 junior suites with terrace. We offer local products at the buffet breakfast and a gourmet shop for snacks For relaxing in between two visits, discover our library space. Close to the Parisian monuments, this Mercure hotel invites you to discover all the history of this UNESCO-classified city. The Arc de Triomphe, Champs Élysées, Eiffel Tower and Champ de Mars are all close by and are not to be missed! Near the Champs Elysées and conference center. Direct access to La Défense. 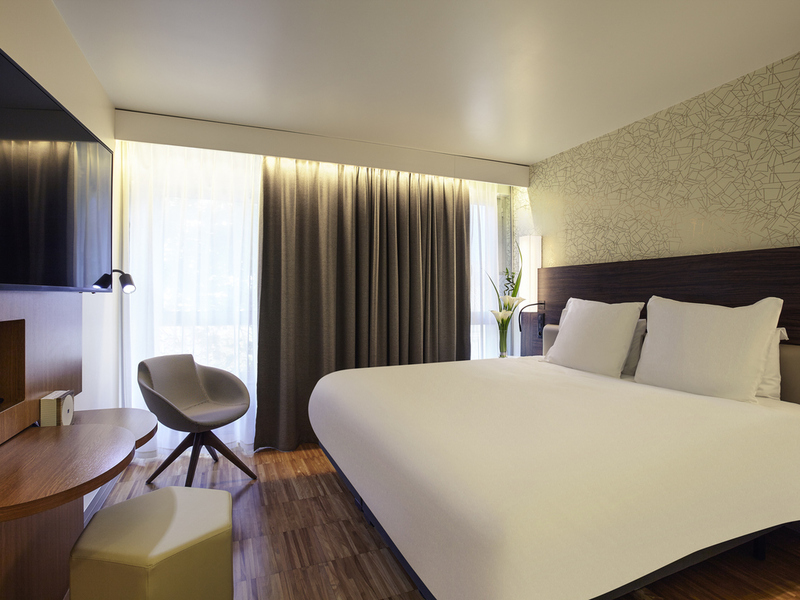 Enjoy relaxing in our modern and functional Superior Rooms, all fitted with color therapy lighting. For even more comfort, you could stay in one of our two suites measuring 323 sq. ft. (30 m²) and featuring a private terrace. Be tempted by our healthy and delicious seasonal dishes, and fill up on vitamins! Our Boutique Gourmande is open 24 hours a day. The hotel offers a selection of fine wines and soft drinks. The staff is lovely very polite and helpful. Manager was very helpful, polite and helpful. Breakfast is good but can improve to be better and great. Rooms are spacious and clean. Lots of places to eat around hotel. I stayed a to 2 hotels while in Paris and I must say the experience on check in and and services when requesting towels need to get them yourself was quite horrible. The cleanliness was good, beds comfortable and the hotel was well situated for a range of shops and eateries. The hotel has a perfect location, virtually a couple of minutes from Arc de Triomphe, from where you can reach all major attractions. We had the possibility for an early check-in even i f we arrived early, which was very nice for us. The room is newly renovated and even if our window was towards a busy boulevard, there was no noise at all. The only negative aspect is that in the toilet you can feel the smoke, even if this was a non smoking room. The room very clean with very comfy bed. Near by with supermarket and restaurants. Walking distance to various metro stations. Check in and out without huddle. Will book with accord again when I'm in oversea. The place has been renovated and is extremely welcoming. My room was on the 8th Floor and to my surprise I could enjoy a little terrace with a view over Paris. Very well located, next to Monoprix, opposite Fnac, few minutes walk to go Arc de Triomphe. Superb location. It was great. A clean room, competent concierge and quiet. Our AC in room 201 didnt work and when we were told everything in the fridge was included, we expected more than 1 bottle of water. Only on the last day was our fridge stocked with the required drinks, but this was too late really and a big disappointment especially when the room was so warm in the night and difficult to sleep. Staff were friendly, but the overall experience was knocked by the above. Great location - central but away from most of the tourist crowds. All the staff we met were friendly and helpful. My only negative experience was plastic glasses and paper cups in the room which contribute to unnecessary waste. There are glasses and ceramic cups downstairs so the facility to wash them is available. I searched an hotel close to Wagram building where I had a professional seminary. I was happy to stay in Mercure hotel. The facility, the staff and services provided were very good. I was on a quick overnight stay, check in/out was rapid and the room was to a high standard. Service (reception & breakfast) needs improvement. Breakfast supposed to start at 06:30 but still at 07:00 no fresh bread and not everything ready. Pleasant stay. It would be useful to have a corkscrew in the room.